It is our pleasure to present you with this year’s Information Kit and provide you with relevant information regarding the 2018 St Vincent de Paul Society Winter Appeal. This Winter Appeal will look at the impossible choices people are forced to make every day, but with the communities support, Vinnies can be there to give people choices that provide the sanctuary, security and safety they deserve. We share the story of a young mother and her two children. Jenny had her safety threatened by abuse. She had her home and security taken away from her. Tonight in Australia, over 116,427 women, children and men are at risk of homelessness. You will know all too well that poverty means that they are faced with impossible choices; sometimes sleeping rough is the only option they have. Vinnies can only be there for people in need, when the community supports us. It is only because of their generous support that we can provide counselling, food and even shelter to families like Jenny’s. This is why it is so crucial that we have your support in talking to your local parishes and communities about this year’s Winter Appeal and asking them to make a difference for people like Jenny by making a donation this winter. 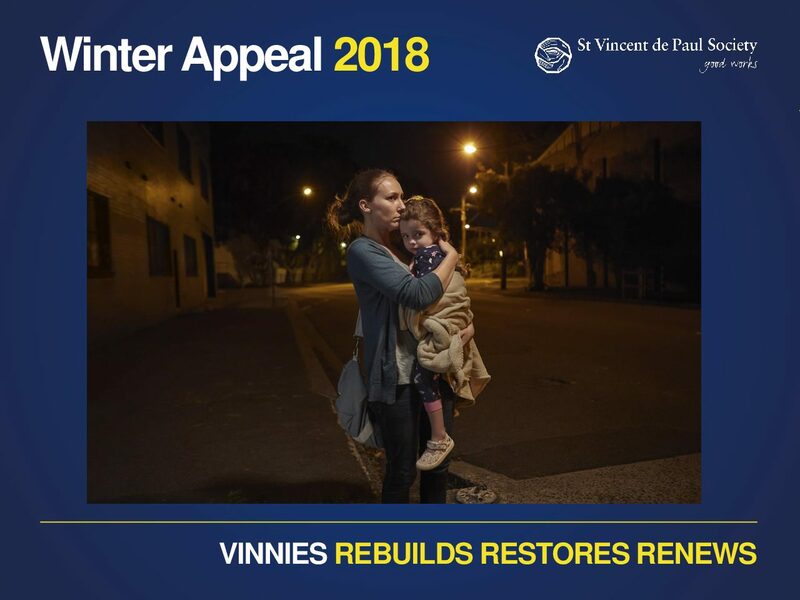 We also ask that you support the Appeal through your Vinnies Shops, by asking customers to make a generous donation towards the Winter Appeal. The Winter Appeal will be supported by a number of advertising media running from 3 May – 9 July. Advertising will be placed on TV, radio, outdoor, press and online media. We are also very happy to support you with any additional media or promotional support that you may need to make sure it is a successful campaign in your Central Council area. If you haven’t already received them, your Winter Appeal resources including posters and Parish envelopes should arrive shortly. Should you require any further materials or if you have any questions, please feel free to contact Andrea Andres on (02) 9568 0211 or andrea.andres@vinnies.org.au.